It is early evening and the sun is setting in central Indonesia. The mild breeze is hugging the white sails being raised, the waves beneath us gently rocking the large boat. On board Star Clipper ropes are being pulled and the anchor retrieved as we prepare to set sail once more. All accompanied by Vangelis Conquest of Paradise. We are leaving an untouched island where we stopped off for just a few hours. I’m sitting on deck with a handful other people watching the magical scene. Taking it all in. The scent of the lush island forest still tickling our noses, the white sand on the beach barely visible. Somewhere beyond the horizon lies Komodo National Park, our destination for the trip. Indonesia is a country consisting of over 17,000 islands. The larger ones are well known and come easily to mind: Sumatra, Java, Borneo. Among the smaller ones, Bali is famous for its temples and white beaches; Komodo for its dragons. A few surfers are drawn to the coast of Sumbawa while adventurous scuba divers head to Raja Ampat. But not many tourists venture past the known spots, in large part due to the difficulty of reaching remote places. Planes will take you so far; busses or motorbikes a bit further. And the really interesting islands—the ones where just a handful of people set foot every year— you can only reach by boat. In my opinion this is the best way to see the archipelago. 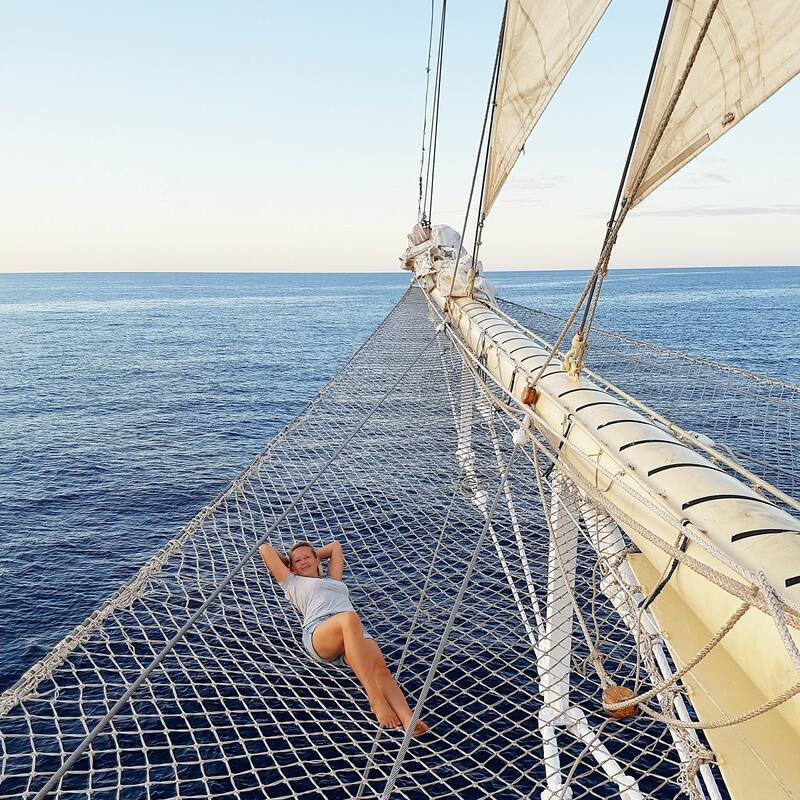 Sailing in Indonesia on a tall ship, even if you choose one less extravagant than the Star Clipper, is almost like being taken back to the years of the early explorers. Living standards are undoubtedly better, though. The food on board can compete with the best restaurants and you might mistake the cabins for hotel rooms. Of course, all this comfort requires space. The Star Clipper is four times bigger than the ships of the 1600-1700’s when the spice trade was at its peak. Still, you can easily forget which century you are in when you experience the magic of sitting alone on deck, stars above, wind in the sails, uninhabited islands lit up by the full moon. This is how the first Europeans came to this part of the world. Sailing is probably how the first people came to this part of the world. If you are interested, the officer on duty will show you how to navigate the stars, climb the masts and steer the boat. You aren’t just on a cruise. You are sailing a tall ship. Although the beauty of the ship is unquestionable, the real treasure for me was getting up in the pitch-black predawn hours, coffee in hand, chatting with the first officer. Having sailed the ship around the world for over twenty years, he was full of stories and facts about the sea—some of them probably not true, I’ll admit. But isn’t that the promise of the tales of the sea? That they are sometimes so unbelievable, you don’t know what to think. The adventures of the early sailors are almost forgotten, but I believe the sagas of the sea linger in all of us. It is part of who we are, part of how we found our way. 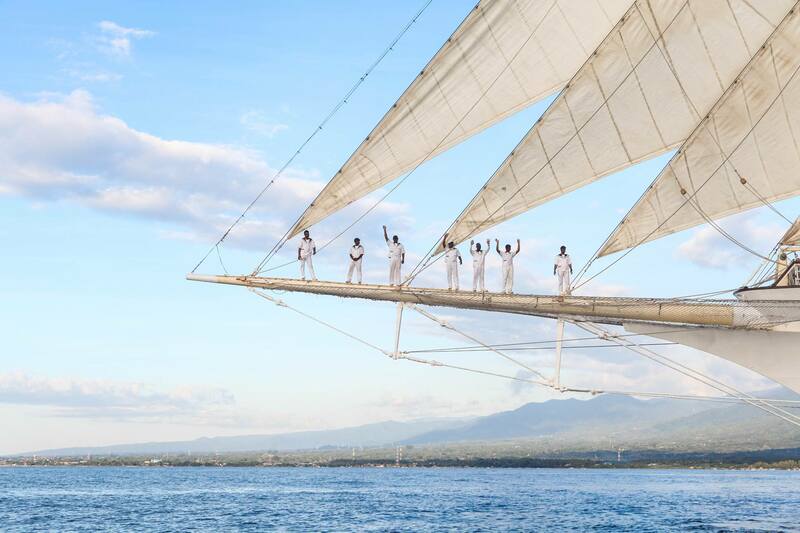 Will you rediscover a piece of your own hidden story while sailing a tall ship in Indonesia? I can’t promise that you will. All I can say is… I did.